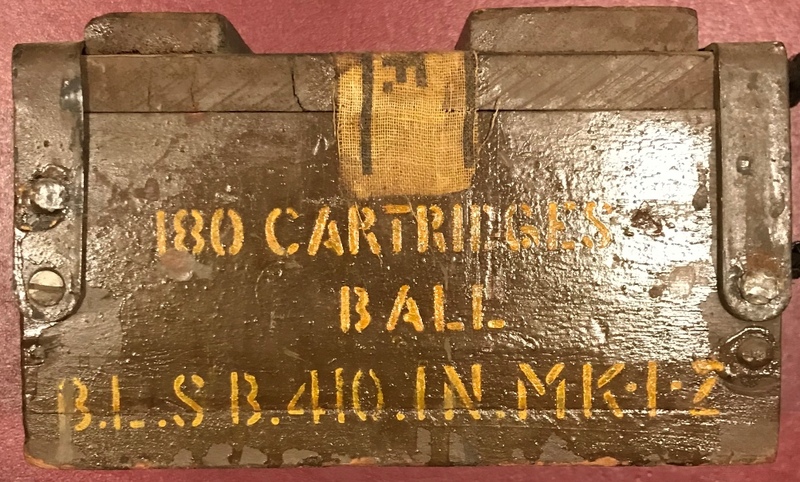 In the last couple of years 180 round wood crates of Pakistani .410 single ball cartridges have become fairly common here in the United States. Referred to by the British as a 'half case', these crates are tiny by crate standards, measuring just 8 1/2" x 6 7/8" x 5 1/8". Though small, they are constructed about as securely as a Brinks armored truck, which seems a waste since the full crate weighs just over 14 pounds, and several could easily be picked up at once and carried off by someone bent on stealing the cartridges inside. 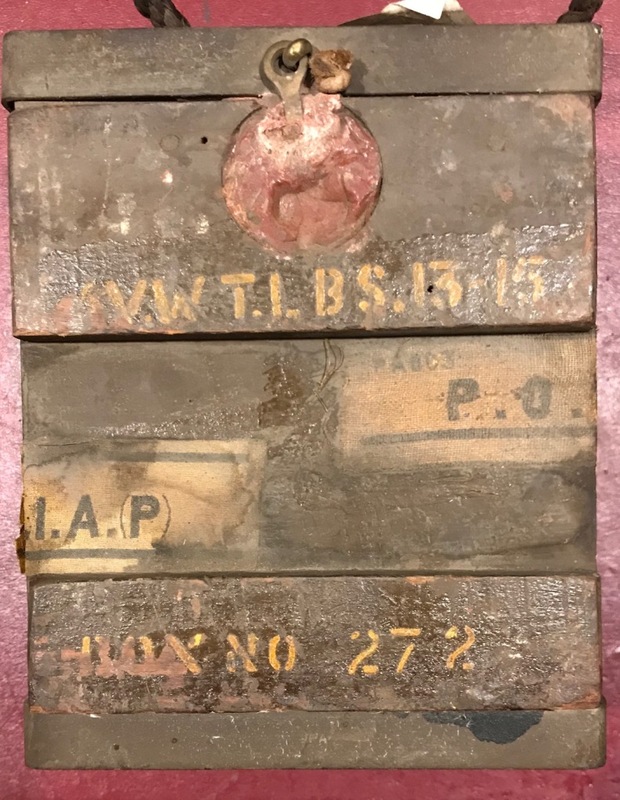 Nonetheless, a couple of anti-tamper measures are used on the crate that will provide an indication that it has been opened. These are shown in the photo here and the two just below. The first of these anti-tamper measures is a plug of a red crumbly plastic-ish material (wax?) that fills a shallow 1.75" diameter hole drilled into the top of the crate. It secures a brass latch-like arm which is attached to one of two metal straps that hold the ends of top of the crate securely in place. Once the red plug is broken, the arm is freed and the end strap that it is attached to can be pivoted outward, freeing that end of the top and allowing the lid to slide out from under the other end strap. In the process of removing the top, two strips of cloth, one attached to each end of the top and a short distance down each side of the crate, would have to be cut or would tear free, providing another indication that the crate had been opened. These cloth strips are white; one is marked in black PA802 C.I.A. (P), and the other is marked in black PA803 P.O.F.. I'm not sure what the C.I.A. (P) is, but the P.O.F. indicates the ammunition was produced at the Pakistani Ordnance Factories. Stenciling in yellow paint is applied the top, both sides, and one end of the crate. Stenciling on the first photo above is pretty self-explanatory; AV.WT.LBS.14-15 meaning average weight in pounds is 14 to 15 (pounds), and BOX NO 272. This crate weighs 14.5 pounds. The sides are shown in the next two photos above; both are stenciled 180 CARTRIDGES / BALL / B.L.SB.410.IN.MK-I-Z. 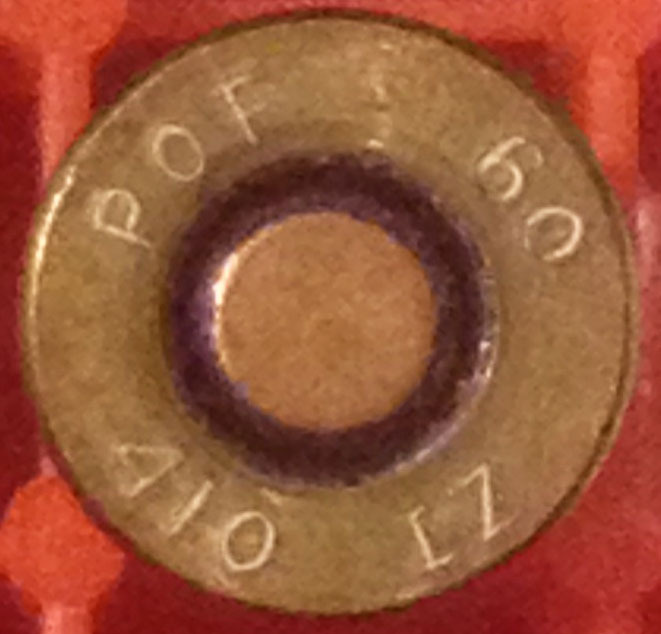 The bottom line of the side stenciling is interpreted as breech-loading single ball .410 version Mark I using nito-cellulose powder (Z). 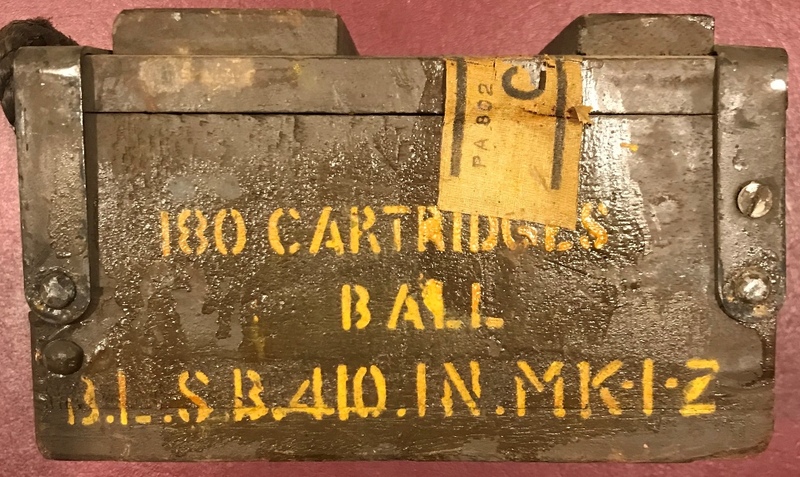 One end end of the crate is stenciled LOT 20 / 60, which would mean that this is the 272nd box (as stenciled on top of the crate) from the 20th of 60 lots of this ammunition. The highest numbered crate I have seen in my Googling the internet was 571. Also stenciled on that end is P.O.F. 11.10.60 which indicates the crate was packed at the Pakistani Ordnance Factories on 11 October, 1960. The attached label with the 6 in a red ball I assume is an explosives classification. The label is marked GOVERNMENT EXPLOSIVE D.P.A. 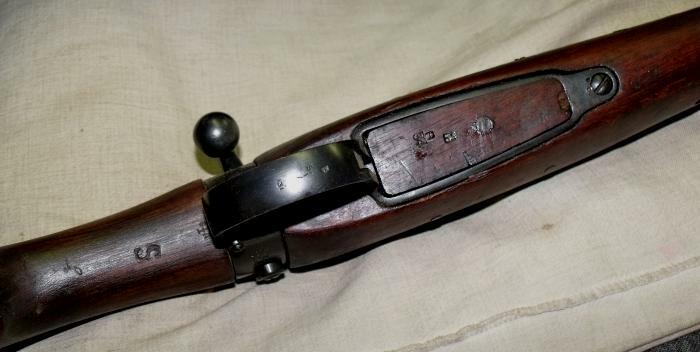 (with a British broad arrow mark over the P), and SAFETY S IX CARTRIDGES. 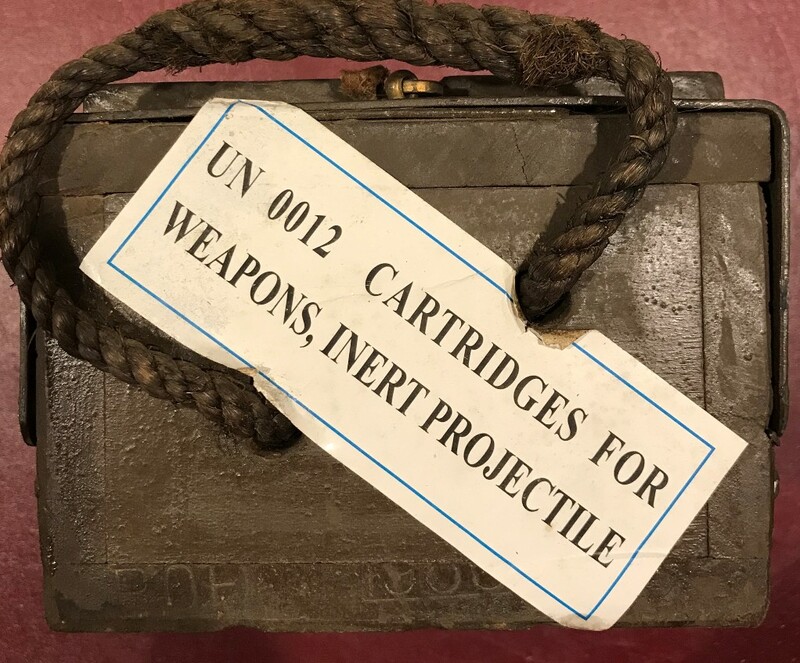 The other end of the crate was originally unmarked, but has had a white import label attached for shipping purposes, indicating the contents are United Nations dangerous explosive materials category 12 - cartridges for weapons, inert projectiles. Once opened, the crate will be found to contain a tin with a handle attached. A label on the tin provides instructions for opening it; TAKE hold of the wire loop (handle) and tear off the lid by giving a sharp pull. 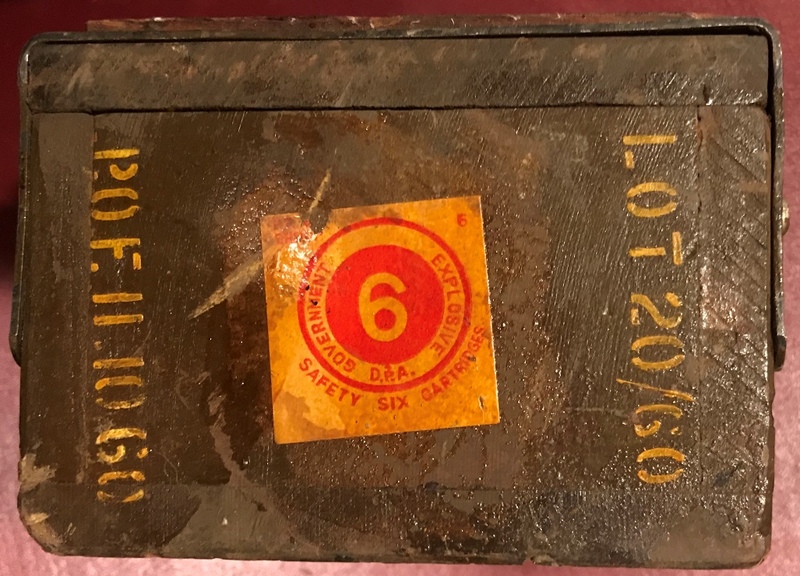 Another label includes the lot number (20/60) and the date the tin was packed, which matches the 11 10 60 date stenciled on the end of the crate. 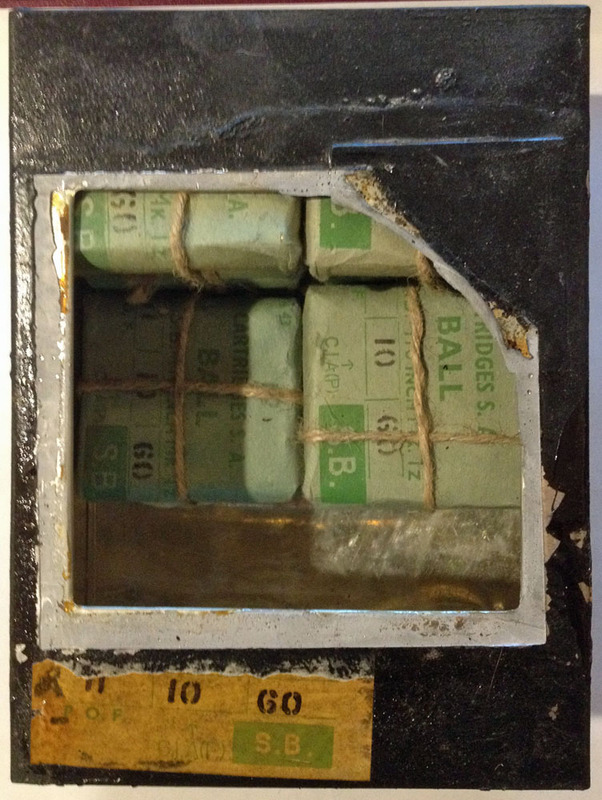 The tin contains 18 string tied 10 round green paper packs of cartridges labeled 10 / CARTRIDGES S.A. / BALL / B.L.S.B .410 INCH MK. 1z / 11 10 60 / P.O.F. C.I.A. (P) with a large S.B. on a green background. 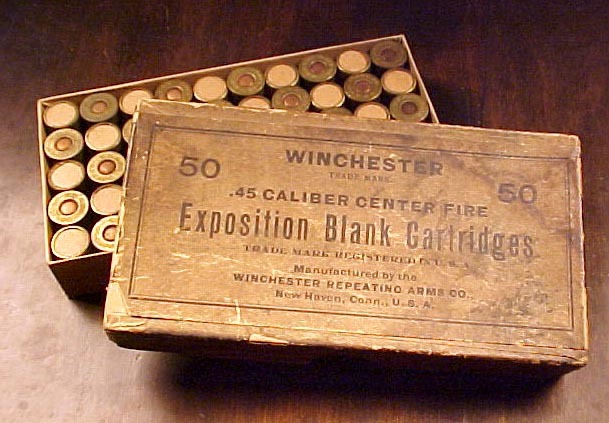 These cartridges were made to be used in production .303 Lee-Enfield rifle that were converted to single shot muskets by boring out the barrels, modifying the forward portion of the chambers to accept the un-necked .303 case that was used for the .410 Mark I single ball cartridge, and filling the magazine well in the stock with a wood plug. Thousands of these muskets were made up at the rifle factory in Ishapore, India beginning in the early 1930s. 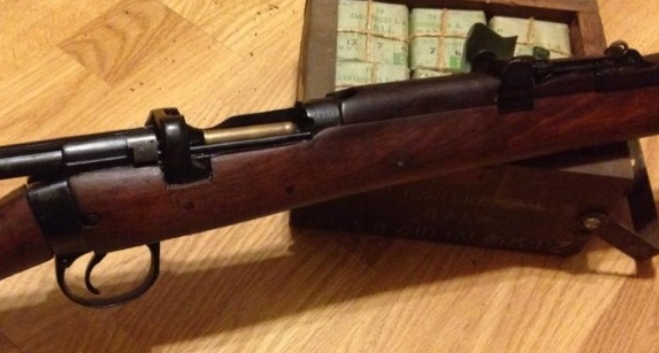 The cartridges in my packets are in pristine condition, and would likely be shootable, if I only had one of the converted Enfield rifles to give them a try. These cartridges would be a very loose fit in the chamber of a standard .410 shotgun and it would be dangerous to attempt to use them in a gun for which they were not intended. 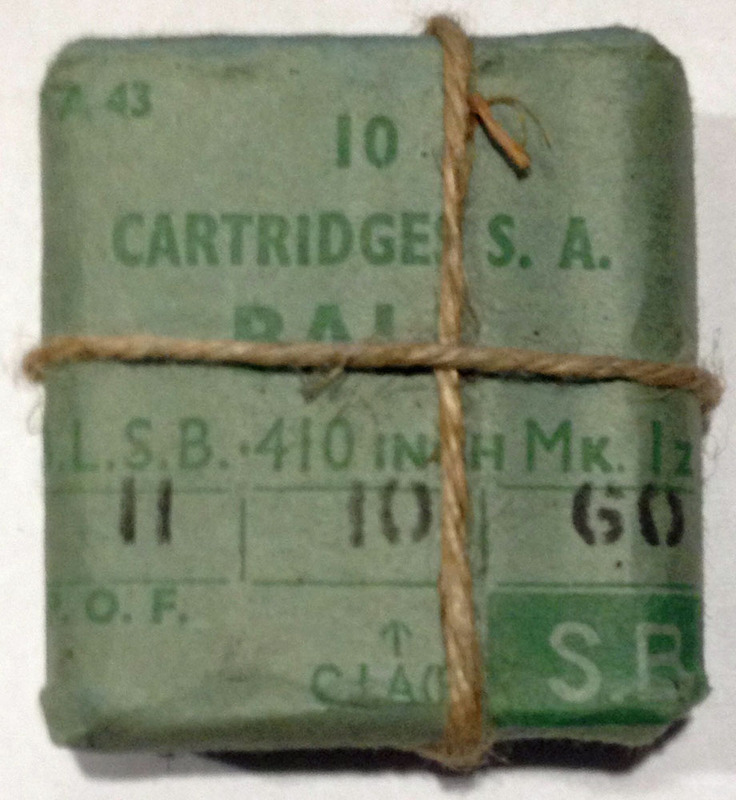 The headstamp on these cartridges is POF 60 410 IZ, indicating that they were made at the Pakistan Ordnance Factory at Rawalpindi, Pakistan in 1960. 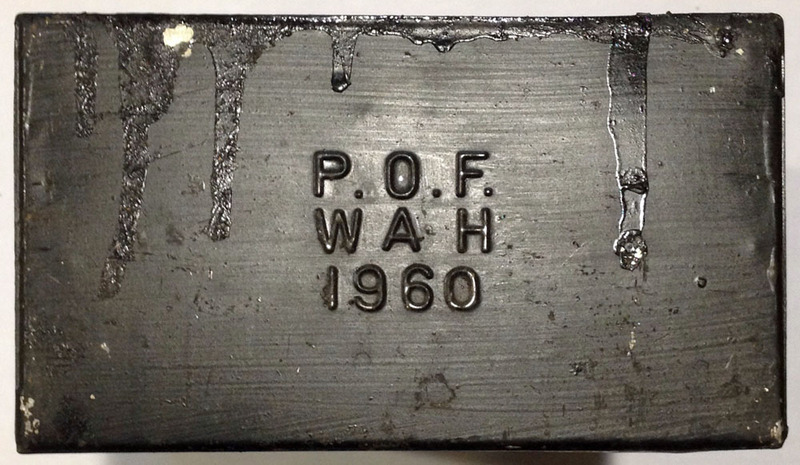 Packing dates on crates that are pictured at various sites on the internet range from April through October of 1960, and all of those that included a photo of the headstamp matched those in my crate. After a great deal of pounding with my inertia bullet puller, I was able to force the ball past the case mouth crimp and get the components out of the case. As advertised, there was a single round ball, in addition to three thin card wads, felt wads in three different thicknesses, and a charge of small, round, flat grain s of nitro-cellulose powder.